Forget that "first day of spring" that shows up on your calendar in March. 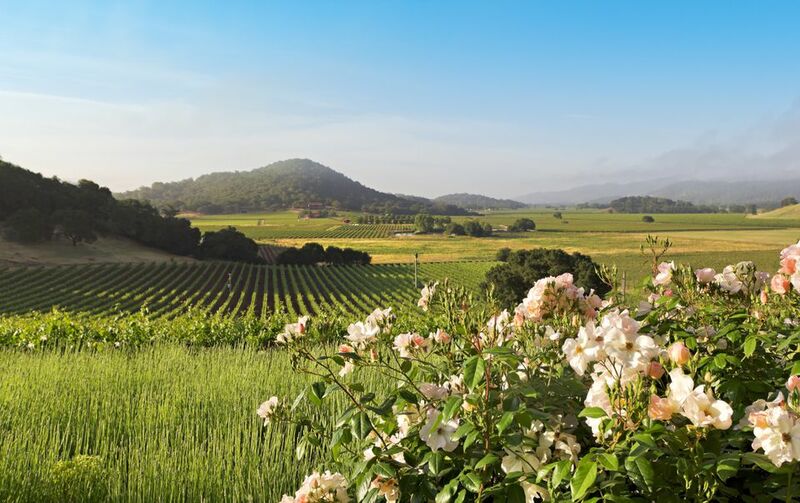 In the Napa Valley, the season starts in February and lasts through May. Weather can be variable this time of year. In a wet year, you might get rained on. Don't let that worry you, though: most tasting experiences are indoors. In the spring, new shoots break out of the dormant vines. They can grow as fast as 1.5 inches in a single day. If you get close to the vines, you'll also see tiny clusters of grapes starting to form. The date when they first appear is called "bud break, " and it gives the first hint of when the grapes will be ready to harvest. The most eye-catching sight in spring is the bright yellow mustard blooms. They appear when the vines are still bare. In a good year, it's a spectacular sight, with yellow carpets of blossoms everywhere and photos popping up on social media with tags like #mustardflowers, #likeadream, and #napainspring. On the average, daytime high temperatures will be in the 60s and 70s F and lows from the mid-40s to mid-50s. February is Napa's wettest month. Chances of rain taper off as the year goes on, but, on average, March is still has levels of precipitation. Conditions vary so much that the only way to get an accurate idea of the weather for your trip is to check the short-range forecast before you go. You never know when an unseasonable hot spell, cold snap or rainstorm might happen. Pack a few light layers and a jacket, especially for evenings that can get chilly. Check the short-term forecast for rain and take an umbrella or rain jacket if it's in the forecast. People in Napa seldom dress up, even at some of the top-rated restaurants. If you are planning on a splurge at the French Laundry, their dress code requires men to wear jackets but ties optional. In most other places, stylish casual attire is fine but call to ask if you are in doubt. If your planned winery visits include going into their caves, you need to know that the underground temperature in Napa is about 58 °F (14.5 °C). That may be optimal for aging wine, but it can leave you shivering if you don't take a jacket. If you plan to take a winery tour that includes a walk through the vineyards, take shoes that are good for walking on uneven, bare ground. Sadly, the Napa Valley Mustard Festival, a popular spring event for many years, fell victim to hard economic times and it hasn't come back. But that doesn't keep the yellow mustard blooms from showing up to brighten the bare grapevines. The Napa Valley Marathon happens in March, something you need to know about even if you aren't going to run 26 miles because it affects traffic on Silverado Trail all the way from the town of Napa to Calistoga. The BottleRock music festival has become so popular that all the hotels anywhere near the Napa Valley get filled up as soon as the tickets go on sale. The same is true for any house rentals you may have had your heart set on. BottleRock happens in late May and sometimes lands on Memorial Day Weekend. Check this year's date on their website. A few wineries also have lovely lavender gardens, like Ceago , which is north of Napa in Clear Lake. Napa can be a little crowded on weekends and holidays in the spring, especially for Valentine's Day and Easter. If you can visit on a weekday, Napa is decidedly quiet, with tasting room staff relaxed and ready to give you lots of attention. If rain is forecasted or happened shortly before your trip, avoid winery tours that take you walking through the vineyards where it will be muddy. If you are flying to Napa and want to take a bottle or two of wine home with you, you won't be able to get any of it through the TSA check-in. If you want to try putting a couple of bottles in your checked baggage, pack some bubble wrap to prevent breakage, and take some plastic bags and tape to contain any mess in case they do break.